Backstop Solutions has purpose-built a suite of productivity solutions for both public and corporate plan sponsors. 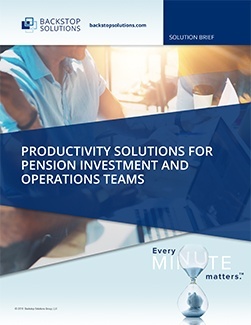 Read our solution brief to understand how defined benefit investors use Backstop Solutions software to achieve greater agility and make the most of their minutes, enabling them to ultimately make better investment decisions and fulfill their fiduciary responsibilities to their members. Access Our Complimentary White Paper!